I’m very busy in my day job so I am making this a quick post. You will notice from this video that the initial under colour was not the usual unmixed paint straight from the tube with only White Spirits. This time the colours were mixed with white and applied with the solvent. This is a critical difference. Allowing white paint into a painting in the early stages can be disastrous. Because this is a snowscape, which ends up almost all white, makes this less problematic. In a standard landscape, I will paint the landscape and at the very end will ‘turn on the lights’ by adding paint containing white. I am so particular about keeping white away from the paint mixes I will wipe the palette to remove white paint. Here is the video. See you soon. 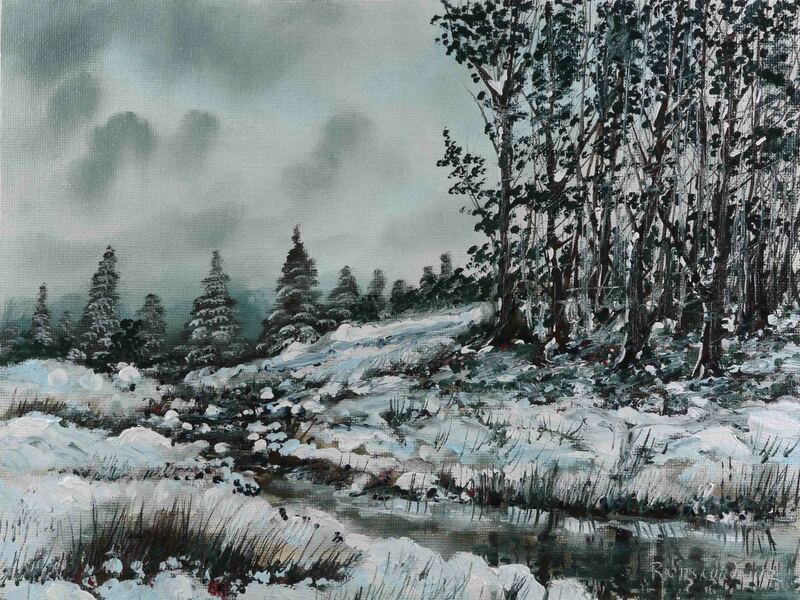 This entry was posted in Oil Painting and tagged Art, Christmas Cards, Culture, Education, Inspiration, Irish landscape, Medium, Oil Painting, Oil Painting Instruction, Oil Painting Landscape, painting, Pictures, river, Snow Scene, winter. Bookmark the permalink. Enjoyed watching again. Love how you make snow look so easy. I’m glad you enjoyed, thank you.